Earn $54.86 in VIP credit (5486 points)What's This? 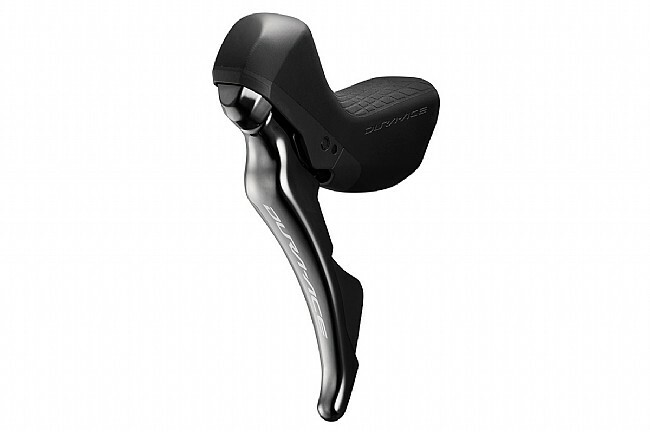 The Shimano Dura-Ace ST-R9120 Shifter/Hydraulic Brake Caliper improves on Shimano's best-in-class mechanic shift performance with these redesigned shift levers. Pairing brand new R9170 Hydraulic brake caliper with the redesigned ST-R9120 levers, this new Dura-Ace provides reliable, predictable performance. Featuring improved ergonomics for comfortable hand placement, and a redesigned internal shifting unit, the new 9120 levers deliver lighter front shift performance with a shorter lever stroke. The 9179 hydraulic brake marks the first ever Dura-Ace disc brake. With Shimano's Ice-Tech technology returning, this hydraulic caliper delivers the maximum in braking power, consistency, and modulation for serious racing. This Dura-Ace ST-R9120 Shifter/Hydraulic Brake Caliper is side specific and includes only one Left or Right shifter/brake caliper. Claimed weight: Shifters – 505 grams, Brake Calipers – 256 gram. Redesigned Dura Ace Shift levers feature improved ergonomics and redesigned shift unit. Redesigned shift unit improves front shifting performance and shortens lever stroke. Redesign of front system works in tandem with new Front Derailleur. Comfortable grip and operation from improved ergonomics. Customizable and precise lever operation. Expanded reach adjustment range to 14mm.